Tired of your old shower space or ready for a change to your bathroom decor? There’s one critical change you should consider making to your bathroom, and that’s buying a recessed tub. A recessed tub is a basic alcove design that fits against the bathroom wall and only has one side open for the viewer. Picking out a recessed tub can be difficult because you have to choose the style, whether your tub design is left- or right-handed, where the drain locations are, and whether it has a shower unit attached or not. A shower unit makes it more difficult because you have to connect the nozzle to your plumbing, which often involves knocking out a section of your wall. We hope these best recessed tub reviews will give you a few ideas. 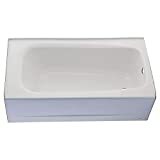 American Standard Cambridge 5-foot Tub – This recessed tub has a slip-resistant surface and a durable proprietary material with a porcelain finish. The left-handed drain might be awkward, but for some bathrooms, it may work. We like the slip-resistant surface because it makes it safer. Kohler Curved Alcove Bath – Where most of the bathtubs we’ve seen have a straight profile, this one creates a curved profile and curved basin for a different appearance than the norm. One thing we like about this product is the flanged tile, which lessens the likelihood of water seeping behind the tub and damaging your wall. American Standard Evolution 2425 – This bathtub adds an extra measure of comfort because of its built-in armrests and backrest. 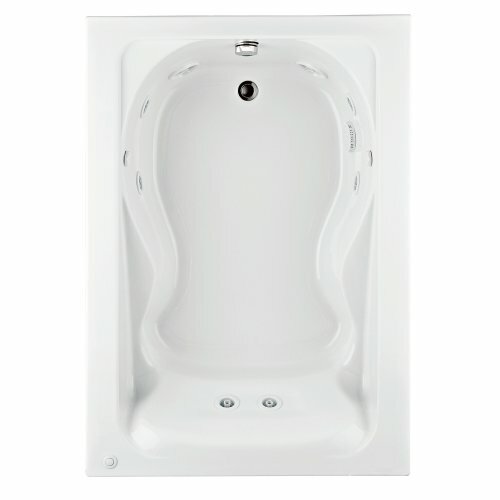 Rather than a straight drop, the 2425 model lets you get the same amenities you would in a claw foot tub. It also has flanged tile and a removable apron for easy cleaning. 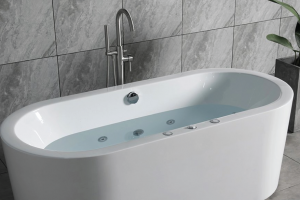 American Standard 227201B Cadet Whirlpool – Most recessed tubs are the ‘sit and soak’ variety. This one is unique amongst the bathtubs we looked at because it adds an element of hydrotherapy. Eight whirlpool jets agitate the water, two from each side. If you want luxury, this is the tub for you. 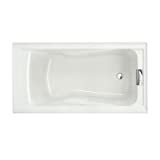 Kohler Archer 6-foot Bath – If you have a larger bathroom you should consider this tub. Most recessed tubs have no more than 5 feet of length. This one has 6 feet of space, giving even the tallest of people plenty of stretching room. You also get arm rests and built-in lumbar support. Without further ado, let’s take an in-depth look at each tub and share their highlights and drawbacks. 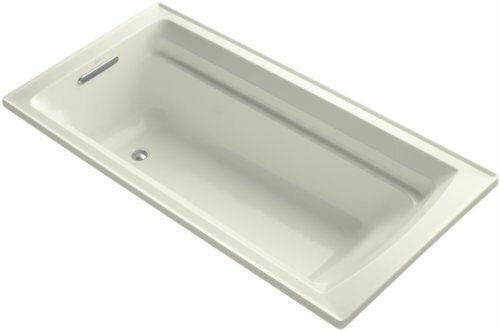 This is a basic recessed tub. It has slip-resistant floor coating with porcelain finish, which makes it a little harder for this tub to retain heat. However, because of its construction, it’s easier than other tubs to keep clean. 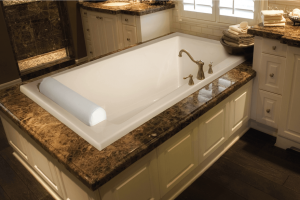 The apron of the tub fits over the ledge where your tub will be placed and helps create a stopgap against water damage. Some customers reported that the slip-resistant coating didn’t work quite as well as it should have, but only a few. Still, it’s a good idea if you’re careful when climbing into or out of the tub. The color scheme of the tub is basic white, which goes well with just about any bathroom decor. If you want a different color, you’ll have to look elsewhere. One big problem we have with this tub is that it only comes in left-handed drain style. Some tubs, upon ordering, present the option to have them as left or right to fit your given decor. 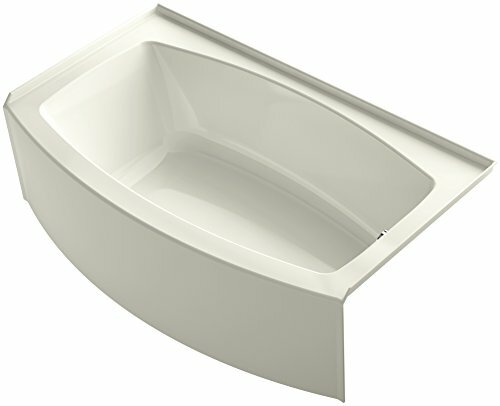 The Kohler Curved Alcove bath has many of the same features as does the American Standard. However, it looks a little more aesthetically pleasing in our opinion. 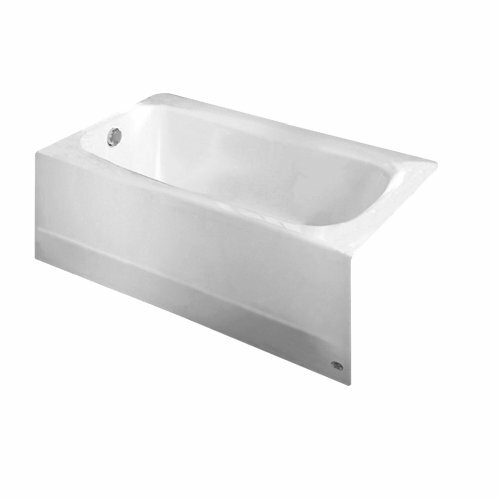 The curved lines and embedded apron add to the appearance of this tub. The dimensions of the tub are standard if a bit lower than we would prefer. The tub is five feet long, three feet wide, and 18 inches high. Slip-resistant coating exists in this tub as well, but some customers reported that it felt rough on their skin. The acrylic coating is, however, easy to clean. Tubs made of different materials tend to scratch or chip, leaving you with an expensive repair bill. Acrylic, porcelain, and stainless steel are all easy-to-clean materials. 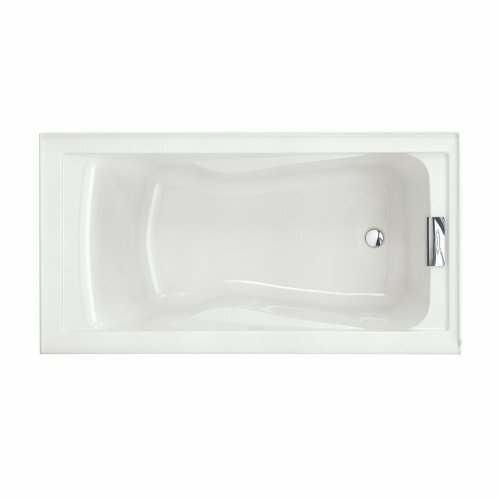 You can expect to pay around $800 – $900 for this recessed tub. It’s not the best price in the world, but the tub is reasonably high quality. We’d prefer if the tub had more features to justify the extra price. This tub adds a little something extra to the experience, even if it’s a small something. On the surface, you might be wondering, what makes this tub good? It has the same type of construction and materials as do the others on this list, which isn’t a bad thing; acrylic works well for bathtubs. This tub aims to fit the human form a little more clearly. You have a back rest and a set of arm rests. Perfect for lounging back and relaxing with a good book and a glass of wine. One bad thing about this tub is that some customers noted that it feels a little shy of the five-foot mark that was advertised. Because this only happened in a few cases, we’re willing to chalk it up to a manufacturing error on those specific ones. The apron has a removable access panel, which makes it easier to clean under it. Everything aside, we think it’s well worth the price. You can expect a $500 – $600 price tag, which is less than some of the tubs we reviewed. There aren’t many simple recessed tubs that offer the level of luxury the Cadet Whirlpool does. It has built-in whirlpool jets evenly spaced around the edge of the tub, designed to massage your body by agitating the water. It is made of acrylic and fiberglass, some of the most durable and easy-to-clean material you’ll find in a recessed bathtub. 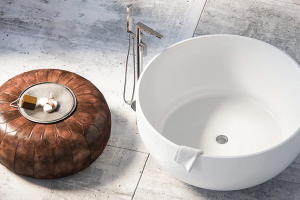 The tub itself is designed to be form-fitting, which is why the interior is shaped so oddly. If you look at the edge of the tub, you can see an accessory shelf above water level, which is where you would put shampoo, soap, and other materials. The Cadet is also an extremely hygienic tub: the company, if you opt for professional installation, puts a silver ion compound in the drain pipes, making it less likely that mold and mildew will form. The only real downside to this tub is that it takes a lot of water to operate. Not just to fill it up, because it takes about 50 gallons which is the standard amount. However, when you factor in the whirlpool jets, your water usage can add up. If you have larger people in your home who want to soak in a tub, this Archer model is a great fit, literally. Where most bathtubs aren’t longer than 5 feet or deeper than 18 inches, this tub ensures that even larger people get the room they need. 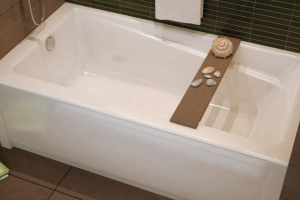 The tub is six feet long and adds an extra three inches to the available water height. Its clean, straight lines make it look sleek and suited for just about any kind of bathroom decor. Another factor that sets it apart is the slotted overflow setup. Most tubs only offer a single drain, but what if you slosh water over the side? With this tub, errant water always has a place to go. The only factor we don’t like is that the drain components have to be sold separately. We feel like the tub should come with all its components as part of the price. The tub is a bit more expensive than others, but we attribute that to its larger size. It runs in the $1,000 – $1,100 range. A recessed bathtub, also called an alcove or drop-in bathtub, is the most widely used design in United States homes. It fits into an opening in the wall and floor of the bathroom, using most of the surrounding structure as support while the remaining open side is the entrance. Recessed bathtubs work well for smaller baths or people who don’t want to have to worry about their decor too much. After all, you can only see one side or even just a ledge. To determine whether a recessed bathtub will be right for your bathroom, first measure the space you’re going to have. If you don’t plan on doing extensive remodeling, you’re likely sticking with an existing defined space. Usually, you do this when your old bathtub has started leaking, or you don’t like the way it looks anymore. After removing the old fixtures with the help of a plumber, you’ll need to measure the spot with a tape measure. Measure all three dimensions, and verify that they are a close or exact match. After you know how much space you have to work with, then you can get started. The materials used in recessed tubs typically include acrylic, enameled steel, or plastic. Plastic is the easiest to mold into different shapes, which works best if you have an irregularly-shaped space or are on a tight remodeling budget. The problem with plastic is that it can deform and discolor easily over time. Another material you’ll see on recessed bathtubs is enameled steel. This is steel with a coating of porcelain. It’s the most common and least expensive, The problem, though, is with heat transfer and chipping. The transfer of heat starts and occurs quickly. Enameled steel isn’t quite as good at maintaining surface heat, but it doesn’t take as long. Finally, you can use cast iron. Of course, the problem with cast iron is that it’s extremely heavy, so you’ll need to have your bathroom on the ground floor. If you aren’t confident that your floor will hold the extra weight, either reinforce the floor or pick a different pot. Of course, this means you’ll have to remodel the bathroom entirely. 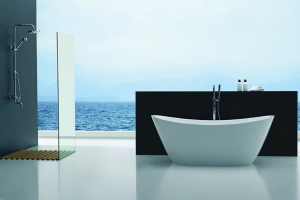 Other materials like cast polymer and metal composites exist, but they are somewhat new to the bathtub market. In a basic recessed bathtub, all you need to account for is the faucet, drain, and maybe the shower head. 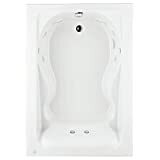 If your tub has things like a whirlpool jet or other amenities, you have to make room for the electronic parts as well; the pump, switch, and timer are key. While the pump might be able to fit under the tub, the switch and timer need to be located in a dry spot, so you don’t run afoul of building code requirements. Make sure you have enough space and can install a new electrical circuit if necessary. Finally, make sure your water heater has enough power to fill the tub without depriving the rest of the house of hot water. Your water heater’s capacity should be at least half again that of the tub. Recessed tubs are some of the most classic and cost-effective fixtures you can have in your bathroom, and taking a long soak in a tub occasionally is great for relaxation. Based on the tubs we looked at, we have to say that the American Standard Evolution fits our criteria most closely. Not only does it have quality materials, but it also makes the bather feel comfortable with its ergonomic design. Of course, you may want to try a different model. We hope our best recessed bathtub reviews have given you some insight into what you need out of your next tub.